Caspase is a family of cysteine proteases that play essential roles in apoptosis (programmed cell death), necrosis, and inflammation. There are two types of apoptotic caspases: initiator (apical) caspases and effector (executioner) caspases. Initiator caspases (e.g., CASP2, CASP8, CASP9, and CASP10) cleave inactive pro-forms of effector caspases, thereby activating them. Effector caspases (e.g., CASP3, CASP6, CASP7) in turn cleave other protein substrates within the cell, to trigger the apoptotic process. The initiation of this cascade reaction is regulated by caspase inhibitors. CASP4 and CASP5, which are overexpressed in some cases of vitiligo and associated autoimmune diseases caused by NALP1 variants, are not currently classified as initiator or effector in MeSH, because they are inflammatory enzymes that, in concert with CASP1, are involved in T-cell maturation. Belnacasan (VX-765) is an oral prodrug of VRT-043198, a potent and selective caspase-1 inhibitor with a Ki of 0.8 nM. Q-VD-OPha is an irreversible pan-caspase inhibitor with potent antiapoptotic properties; inhibits caspase 7 with IC50 of 48 nM and 25-400 nM for other caspases including caspase 1, 3, 8, 9, 10, and 12. Q-VD-OPha is able to cross the blood-brain barrier. Z-DEVD-FMK is a specific and irreversible caspase-3 inhibitor with IC50 of 18 μM. Z-IETD-FMK is a selective and cell permeable caspase 8 inhibitor. Emricasan (PF 03491390) is an irreversible pan-caspase inhibitor. Dehydrocorydaline (13-Methylpalmatine) is an alkaloid isolated from traditional Chinese herb Corydalis yanhusuo W.T. Wang. Dehydrocorydaline regulates protein expression of Bax, Bcl-2; activates caspase-7, caspase-8, and inactivates PARP. Chelidonic acid is a component of Chelidonium majus L., used as a mild analgesic, an antimicrobial, an acentral nervous system sedative. Chelidonic acid also shows anti-inflammatory activity. Chelidonic acid has potential to inhibit IL-6 production by blocking NF-κB and caspase-1. Chelidonic acid is a glutamate decarboxylase inhibitor, with a Ki of 1.2 μM. Ac-DEVD-CHO is a specific Caspase-3 inhibitor with a Ki value of 230 pM. PAC-1 is an activator of procaspase-3 induces apoptosis in cancer cells with EC50 of 2.08 μM. Ginsenoside Rh2 is isolated from the root of Ginseng. Ginsenoside Rh2 induces the activation of caspase-8 and caspase-9. Ginsenoside Rh2 induces cancer cell apoptosis in a multi-path manner. Taurochenodeoxycholic acid is one of the main bioactive substances of animals' bile acid. 2-HBA is a potent inducer of NAD(P)H:quinone acceptor oxidoreductase 1 (NQO1) which can also activate caspase-3 and caspase-10. EP1013 is a broad-spectrum caspase selective inhibitor, used in the research of type 1 diabetes. Ginsenoside Rh4 is a rare saponin obtained from Panax notoginseng. Ginsenoside Rh4 activates Bax, caspase 3, caspase 8, and caspase 9. Ginsenoside Rh4 also induces autophagy. Thevetiaflavone could upregulate the expression of Bcl‑2 and downregulate that of Bax and caspase‑3. Tauroursodeoxycholate is an endoplasmic reticulum (ER) stress inhibitor. Tauroursodeoxycholate significantly reduces expression of apoptosis molecules, such as caspase-3 and caspase-12. Tauroursodeoxycholate also inhibits ERK. Upon binding to their cognate ligand, death receptors such as Fas and TRAILR can activate initiator Caspases (Pro-caspase 8 and Pro-caspase 10) through dimerization mediated by adaptor proteins such as FADD and TRADD. Active Caspase 8 and Caspase 10 then cleave and activate the effector Caspase 3, 6 and 7, leading to apoptosis. ROS/DNA damage and ER stress trigger Caspase 2 activation. Active Caspase 2 cleaves and activates Caspase 3 and initiates apoptosis directly. Caspase 2, 8 and 10 can also cleave Bid, stimulate mitochondrial outer membrane permeabilization (MOMP) and initiate the intrinsic apoptotic pathway. Following MOMP, mitochondrial intermembrane space proteins such as Smac and Cytochrome C are released into the cytosol. Cytochrome C interacts with Apaf-1, triggering apoptosome assembly, which activates Caspase 9. Active Caspase 9, in turn, activates Caspase 3, 6 and 7, leading to apoptosis. Mitochondrial release of Smac facilitates apoptosis by blocking the inhibitor of apoptosis (IAP) proteins. Following the binding of TNF to TNFR1, TNFR1 binds to TRADD, which recruits RIPK1, TRAF2/5 and cIAP1/2 to form TNFR1 signaling complex I. Formation of the complex IIa and complex IIb is initiated either by RIPK1 deubiquitylation mediated by CYLD or by RIPK1 non-ubiquitylation due to depletion of cIAPs. The Pro-caspase 8 homodimer in complex IIa and complex IIb generates active Caspase 8. This active Caspase 8 in the cytosol then carries out cleavage reactions to activate downstream executioner caspases and thus induce classical apoptosis.
. Brenner D, et al. 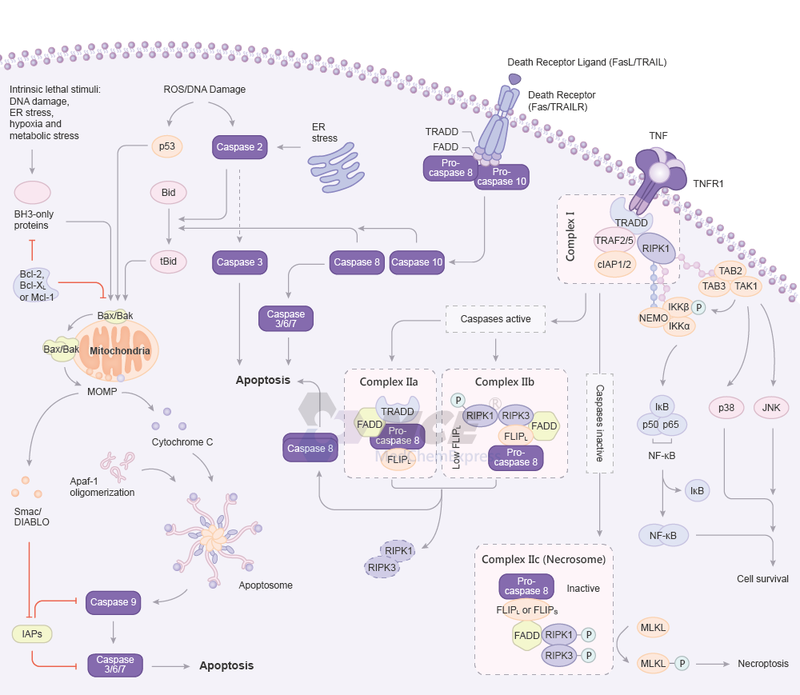 Regulation of tumour necrosis factor signalling: live or let die.Nat Rev Immunol. 2015 Jun;15(6):362-74.